in my house, with the arrival of my new bass. 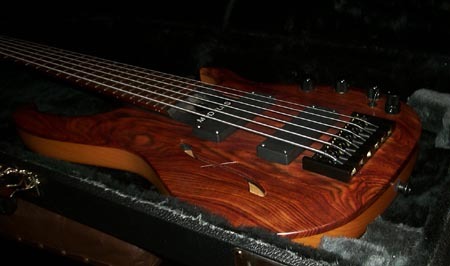 The spec – Modulus fretted 6 string, carved top (the first bass like this that Modulus have ever made!) semi-hollow, Chechen fingerbaord and top, Mahogany body, Bartolini pickups and (I think) Aguilar circuit. 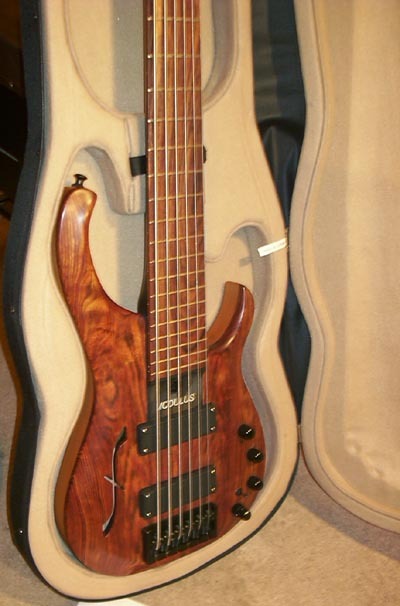 I’ve already strung it up with a set of Elites Flatwounds, which sound amazing on it, and will get a U-Retro preamp put in it ASAP (same as the one in my fretless 6 string). Suffice to say, it’s an unbelievably beautiful bass, sounds incredible, is a dream to play and I’m really excited about the musical possibilities it offers me!